The Euro fell on Thursday as the US Dollar recovered most of Wednesday’s losses after the Fed’s dovish statement. Investors are not giving up on the Dollar as of yet. The greenback is still favored as a safe haven amid the current global uncertainty. In economic news, the EU March Consumer Confidence improved by less-than-expected, printing -7.2, while US data beat expectations, with Initial Unemployment Claims at 221K and the March Philadelphia Fed Manufacturing Survey at 13.7, much better than expected. Moving ahead, both the EU and the US will unveil march PMI today. Investors will mainly focus on the EU data as concerns about slowing economic growth have been on the rise for the past few months. 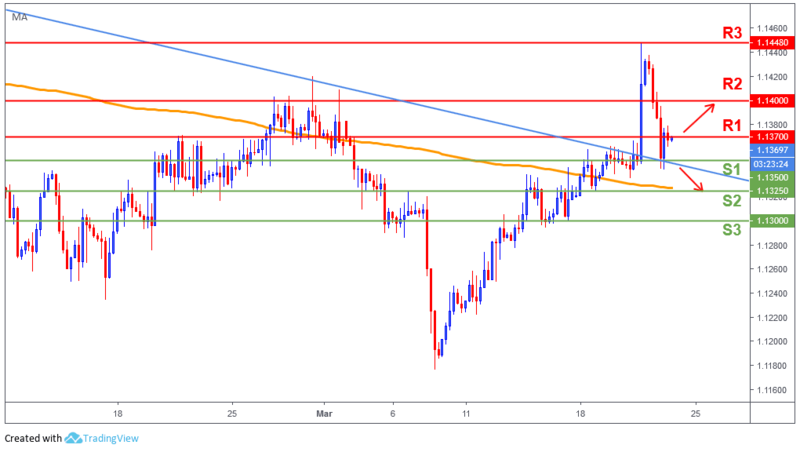 The Euro lost most of the gains during yesterday’s session as it broke below multiple support levels until it found a strong support around our key 1.1350 (S1) level, bouncing back towards the 1.1370 (R1) level. Buying could accelerate should we move past 1.1370 (R1) and we could see further strength pushing the Euro all the way to 1.14 (R2). In contrast, if the bears are able to break below 1.1350 (S1), then price will likely retest 1.1325 which coincides with the 200-day moving average (orange line).